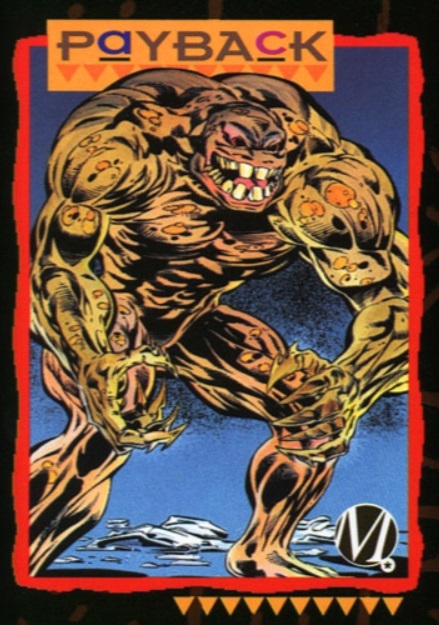 Powers: Payback is a metamorph able to shift between a normal human form and a super powered large monstrous alter ego. In his altered form he has superhuman strength though not to the extent of Icon. He also has claws in his altered form which are capable of rending any known material. Kevin was originally the assistant of the Mayor in Dakota, Thomasina Jefferson (Icon #2, 1993). He tried to have the order to use the experimental tear gas “Quantum Juice” used during the big bang denied but the mayor overruled him. He went to Paris island to warn those gathered their. As a result he was present at the Big Bang and was exposed to the gas. While others died he was mutated and gained superhuman powers (Icon #3, 1993). He disappeared for six months only to make his way to the Mayor’s office and hold her at gun point hoping to get her confession for using the experimental gas that resulted in the deaths of hundreds (Icon #2, 1993). Icon and Rocket interrupted his blackmail attempt and defeated him. He revealed the secrets of the Big Bang to Icon and Rocket before turning himself over to the authorities (Icon #3, 1993).